This October, the Institute for the Humanities is shutting down Liberty Street near U-M campus. 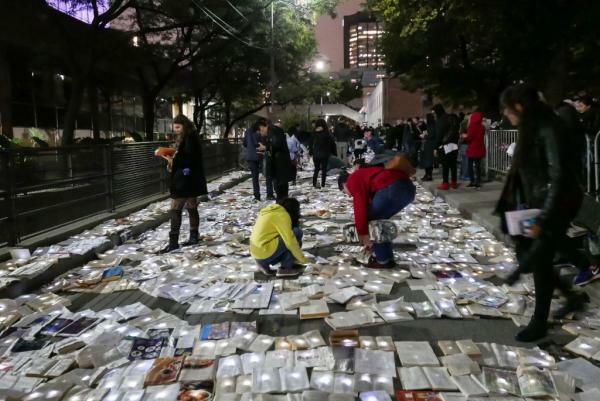 We’re going to reuse thousands of discarded books, turning them into an illuminated pathway for “Literature vs. Traffic,” a large-scale art installation by Spanish undercover art collective Luzinterruptus. Ann Arbor joins Toronto, New York, and Melbourne, as we feature--for one night only--the brilliance of 10,000 books and thousands of LED lights. What was just a street will become a beautiful installation, as we bring the power of art, education, the written word, and free thought to the entire Ann Arbor community by essentially “paving” Liberty St. with thousands of glowing books. This is a grass-roots project and your participation is essential! Visitors: Come view the extraordinary installation, and help us extend the life of a book by taking some books home (Oct. 23 5-11pm, books can be taken home after 8pm).